Demand for personal and real-name user data in China has long outstripped its availability, so the industry has evolved unique methods of coping. Third-party data remains thin on the ground but China’s three internet giants — Baidu; Alibaba; and Tencent (often referred to as the BAT) — have risen to dominate the landscape as consumer data providers. 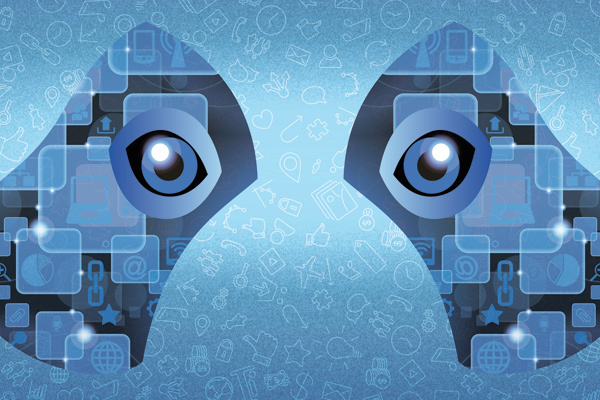 Tencent, thanks mainly to WeChat and its Weibo platform, is the leading source of social data. Baidu collects search and traffic data and has launched several laboratories to mine the information including the Beijing Big Data Lab and the Deep Learning Institute. Alibaba’s Open Data Processing Service analyses the millions of transactions taking place on its e-malls and payment systems. "The reality is, there just isn’t that much data in China," explains Vivian Zhu, managing director of digital, data and analytics at Starcom MediaVest Group (SMG) China. "In the US, data comes in from the credit rating bureau, China doesn’t have that. It moved straight from a cash-society to a mobile payment society." However, while China lags behind in more traditional databases, it has leapt ahead in the areas of mobile, ecommerce and online-to-offline data. "While the QR code never really took off in other markets, it’s very much a normal part of consumer behaviour in China thanks to WeChat. Consumers are also happy to shake their phones to get vouchers — this has all drastically enabled the online-to-offline connection." To get their hands on this information, China’s agencies and marketers rely on exclusive partnerships with the three big publishers and the BAT have moved to capitalise on demand. 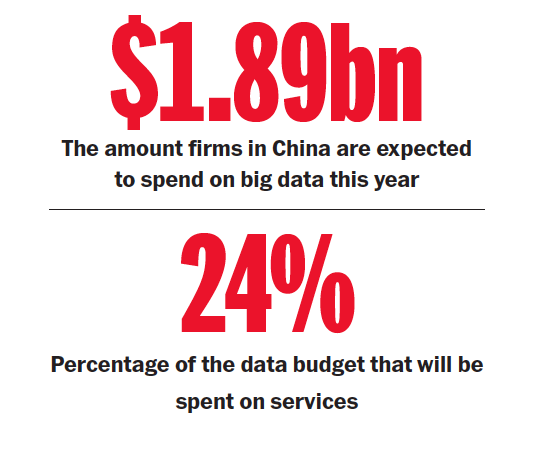 According to data from the China Academy of Information and Communication Technology (CAICT), spending on big data hardware, software and services is this year expected to jump 38% from last year to Rmb11.59 billion (US$1.89 billion), reports eMarketer. One quarter of this sum (24%) is spent on services. SMG has struck a data partnership deal with Tencent, while digital agency group Hylink has agreements with Alibaba and Baidu. Hylink’s deal with Alibaba, for example, gives it access not only to the company’s shopper data but also to its display advertising inventory. "We were among the first to truly use Alibaba’s real-name user data," says Fareeda Cassumbhoy, chief strategy officer at Hylink Digital Solutions. "In 2013, we ran a campaign on behalf of Shanghai General Motors (SGM) for the relaunch of Buick Regal in China. Because it was a relaunch — SGM first introduced the model in 2009 — we wanted to tie the launch to the concept of something a user really wanted years ago but couldn’t afford or decided not to buy at the time." Using Alibaba’s data, Hylink tracked wishlists compiled by shoppers on Taobao and Tmall and placed personalised, tongue-in-cheek animated ads based on the lists. The ads said that Buick Regal may pay for the items if the consumer signed up for a test drive of the new car, and explained why they really needed the item. When users struck lucky, they helped build up the campaign organically with social media posts. Within 12 hours of the weekend launch, the ‘Cheque-out for your heart’s desires’ campaign generated 22,407 participations and 1,928 successful test-drive leads. While the BAT holds sway over China’s digital data sources, its siloed nature has given rise to players such as Miaozhen and Hylink that work to connect data sources. In Hylink’s case, the firm is working to build a user "SuperID" which combines not only online behaviour but the user’s phone number and unique device identifier. "We come across a lot of clients, they have different types of users," explains Cassumbhoy of Hylink. "So what we do is amalgamate the data and try to help them build a SuperID." While anonymized, the data is still linked to a real person — something that can be difficult in China’s bot- and fraud-ridden online world. Referred to in China as "water armies" or "zombies," they’re known to flood the internet with fake comments, followers and clicks. To achieve this, Hylink’s mobile marketing arm WizAd uses an internal system that cleanses data, identifies the unique person and tracks their social activities, behaviour and attitudes. "We are helping our clients build private management platforms — PMPs — to replace traditional research. This is far more accurate because it’s not based on a sample or focus group. It’s a panel that identifies unique customers," she says. One client Hylink is building a PMP for is dairy giant Mengniu. "For example, we’re able to help them make management decisions when it comes to new product development. Using geo-data, we can pick up patterns that will prove the product works," says Cassumbhoy. Hylink's and Miaozhen’s work is unique to China because such data collection may not be permitted in other countries or accepted by consumers elsewhere. "China doesn’t really have a unified law around personal data at all," comments Paul Haswell, partner with law firm Pinsent Masons. "There are bits of data protection law hidden in various contracts, but no dedicated law." Until very recently, companies, he says, were able to collect personal data, including phone numbers, ID card numbers and addresses, put together a profile and sell it on to advertisers. "Because there was no law stopping them from selling it on, these firms could market data as they wished. Some of the more in-depth clever stuff could target you as you walked past things and bombard you with messages throughout the day." But Zhu of SMG doesn’t believe China’s data innovation can be directly attributed to lax personal data laws. "Rather, it’s the product of a captive social ecommerce market." Overall, though, Chinese consumers are fairly relaxed about sharing personal data and more receptive to targeted marketing. "Consumer acceptance and expectations is the number one driving force," she notes. "They are very open to receiving targeting messaging, but they are also now far more demanding. It has to be relevant." For example, on behalf of Walmart, SMG used location-based audience targeting in order to send offers to the consumer’s mobile phone when they were within a two- to five-kilometre radius of a Walmart store. "It was even linked to search behaviours. If you had searched for organic food, for example, you would receive a relevant message." There was a time, continues Zhu, when the Chinese consumer would receive a slew of random messages via SMS. "Things have evolved drastically. That is now way in the past, there were legal boundaries being crossed, I believe." As the industry evolves from understanding what can be done to what should be done, China’s laws are catching up. In March this year, China’s State Administration for Industry and Commerce (SAIC) started bringing in measures to protect personal data. "To use any data collected in terms of name, gender, job, date of birth, health status, consumption habits and so on, you must observe the principles of lawfulness, rationality and necessity," Haswell says. This, he explains, means that companies must consider if it’s legal to collect the data, if they need it and, most importantly, if the user has consented to the data’s use. While consumers are likely to consent, they have grown highly sophisticated in their expectations. What should or should not be done in China has more to do with consumer demands than it does with consumer fears over privacy, says Zhu. "They may not be fully conscious of the use of targeting, but they expect offers and coupons to reach them seamlessly no matter if you’re shopping online or offline," she adds.